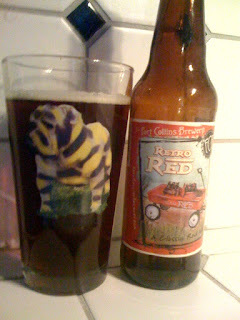 The BR Beer Scene: Beers 1 and 2 in 2011. Okay, time to start making good on one of my New Year's resolutions... try 365 new beers in 2011. I still plan on accomplishing every one of those goals, but this one will definitely be the most fun along the way. Upon declaring this resolution a few days ago I had one beer in my fridge that qualified as a new beer for me... so I saved that one today, and also picked up a few other new ones from Bet-R around the corner. I think they only have one more beer in stock that I haven't tried... seriously. Beer #1 was a... drumroll please!... O'Fallon Wheach. This is the fourth beer from that early Christmas present sampler pack. The "Wheach" is just another way of saying that it's a peach wheat beer. Clever huh? So basically we're looking at a peach version of an Abita Strawberry? I dunno... let's find out. It's a boring looking beer to be honest... golden color with a small white head. Very little retention or lacing to it. The smell is overwhelmingly peach. There's not really anything else to it, but fortunately the peach is delicious. The taste of the beer is where it sees some more complexity. The wheat base is much more apparent, and there is a hint of hops towards the end. It's still a dominantly peach flavor, but really, shouldn't it be? It's a very drinkable, refreshing fruit beer. Not overwhelmingly awesome, but not bad by any means. Beer #2 is another offering from Fort Collins Brewery. I've been seeing them a good bit around town lately, so I picked up a 6-pack of their Retro Red Ale yesterday and waiting until today to break a few out. 6-packs of various Ford Collins brews are all $9.99 at Bet-R if anyone is looking to try them! This one pours an amber color, small head just like the O'Fallon Wheach above. The smell is mostly malty... amber malts and a hint of caramel. Makes sense since this is an American amber / red ale. The taste is more hoppy, with still a decent malt presence. It's easy to drink, but overall this is a rather forgetable beer for me. Up until now Fort Collins hadn't let me down, but this one is nothing special. It's not bad, just... not really great either. And that's the start to my 365 in 2011 goal... with many more to come.